as the winner of one of the publication’s World Changing Idea 2019 awards. The company won the Energy category and was recognized for its transformative utility-scale energy storage technology that sets new benchmarks in economic and other operating performance benefits to global energy providers. Further differentiating Energy Vault’s solution is its unique utilization of environmentally sustainable materials for its core brick storage components, including the ability to use materials that would otherwise require landfill or remediation at significant cost, i.e., coal ash carbonate, hydrocarbon contaminated soils, steel sludge, etc. World Changing Ideas honors businesses, policies, projects, and concepts that offer innovative solutions that can transform the world and help shift society to a more sustainable and equitable future. The winners were selected from a list of hundreds of finalists, which were chosen from a pool of nearly 2,000 entries. Each category was judged by a jury of prominent social entrepreneurs, venture capitalists, thinkers, designers, and a Fast Company editor. Energy Vault’s technology is spotlighted in the May issue of the print magazine, which is available on newsstands today. Renewables have struggled to more fully replace fossil fuel power due to production unpredictability and intermittency from reliance on factors such as wind and sunlight. In the absence of more efficient and cost-effective storage, the amount of electricity that can be delivered to the grid from renewable energy sources, even though now widely affordable, has been limited. Energy Vault’s breakthrough technology was inspired by gravity-based pumped hydro plants that rely on the power of gravity and the movement of water to store and discharge electricity. The company’s solution is based on the same well-understood fundamentals used in those plants, but replaces the water with custom made concrete bricks through an extremely innovative use of low-cost materials. 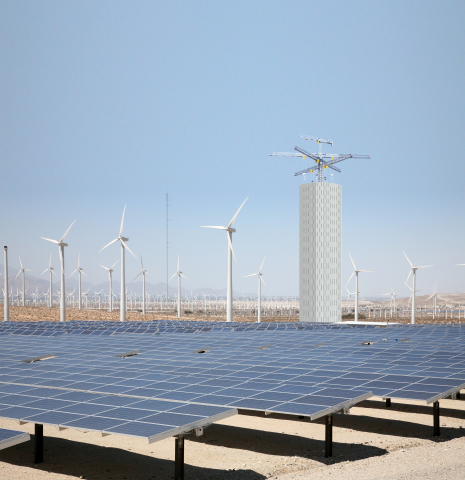 The large bricks are combined with Energy Vault’s patented system design and proprietary algorithm-based software to operate a newly developed crane, which calibrates the energy storage and subsequent electricity discharge while accounting for a variety of factors, including power supply, energy demand volatility, and weather. As a result, the company can deliver all the benefits of a pumped hydro system, but at a much lower levelized cost of storage, higher roundtrip efficiency, and unlimited scalability given the elimination of the requirement for specific land topography and related negative environmental or wildlife impacts. Importantly, Energy Vault’s system can also be paired with renewable generation like solar PV for offgrid and microgrid solutions, allowing commercial and industrial customers to maximize their renewable power usage and delivering on the promise of reliable 24 hour a day power to remote towns and villages in emerging markets. In addition to previously announced customer and strategic partnerships, Energy Vault has initial agreements with other customers on multiple continents. Energy Vault, an Idealab portfolio company, is a creator of renewable energy storage products that are revolutionizing the approach to long duration, utility-scale energy storage. Applying conventional physics fundamentals of gravity and potential energy, the system combines an innovative crane design that lifts specially designed, massive concrete bricks with a proprietary, cloud-based software platform that orchestrates the storage and discharge of electricity. Utilizing 100 percent eco-friendly materials at unmatched cost levels, Energy Vault is accelerating the transformation to a fully renewable world. World Changing Ideas is one of Fast Company’s major annual awards programs and is focused on social good, seeking to elevate finished products and brave concepts that make the world better. A panel of judges from across sectors choose winners, finalists, and honorable mentions based on feasibility and the potential for impact. With a goal of awarding ingenuity and fostering innovation, Fast Company draws attention to ideas with great potential and helps them expand their reach to inspire more people to start working on solving the problems that affect us all.